Product prices and availability are accurate as of 2019-04-15 09:57:04 EDT and are subject to change. Any price and availability information displayed on http://www.amazon.com/ at the time of purchase will apply to the purchase of this product. Ideal for those seeking the extra assurance of covered operation. SoundSeal ® technology delivers ultra-quiet performance. Hold a conversation with normal voices in the same room. MultiGrind ® technology delivers 2 stages of grind vs. 1 stage in standard disposer. Features exclusive Magnetic CoverStart ® Activation. The cover goes in before the disposer goes on. 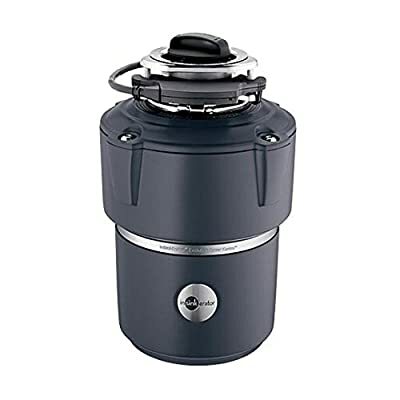 40-Ounce Stainless Steel Grind Chamber and Grind Components handle more volume than standard disposers Magnetic Cover Start Activation offers an extra margin of assurance by running only when the cover is on Sound Seal Plus Makes the Evolution Cover Control at least 60% quieter than standard disposers Multi Grind Two grind stages let you quickly grind difficult food waste you wouldn't put in a standard disposer, like celery and potato peels Comes with a power cord.